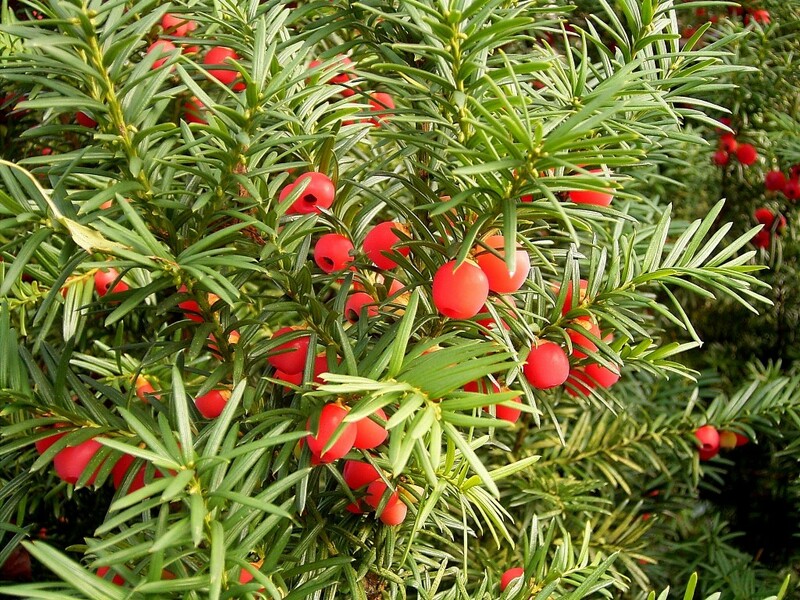 Taxus baccata.seeds with arils.commons.wikimedia.org (Accessed 8/2014). Taxus baccata is a shrub to 20 x 6 m, evergreen Gymnosperm, twigs greenish, bark reddish brown flaky; scales of winter buds blunt, not keeled, persistent at base of new twigs. Leaves spiraled but appearing ranked when growing in shade and on horizontal branches, flattish, needle-like, dark green above, paler with 2 tan bands below, tip gradually tapered to point; evergreen (Rehder 1986). Flowers: No true flowers, sexes on separate plants (dioecious); male cones small, round yellowish. Fruit: No true fruit, females bearing seeds surrounded by red-fleshy aril. Eaten by birds. Habitat: Escapes from cultivation. Old house sites, yard waste. Shade tolerant. Notes: Needles, bark and seeds contain taxine, a very toxic alkaloid (Kingsbury 1964). The red pulp of the fruit-like aril surrounding seed is not toxic. Foliage eaten by deer.